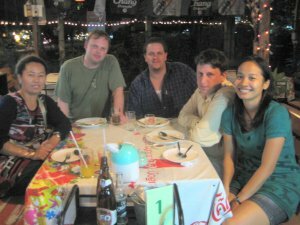 I fly back to Bangkok to catch up with Frank in 2008. Having promised to go and see my old mate Frank at his new home in Bangkok for nearly 2 years, I was feeling quite guilty. But that doesn’t achieve anything. 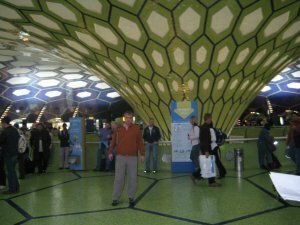 so I fired up Expedia and booked a flight with Ethihad and stopped over in Abu Dhabi airport. Bangkok traditional name is Krunk Thep or city of Angels. Its short for Krung Thep Mahanakhon Amon Rattanakosin Mahinthara Ayuthaya Mahadilok Phop Noppharat Ratchathani Burirom Udomratchaniwet Mahasathan Amon Piman Awatan Sathit Sakkathattiya Witsanukam Prasit – the longest place name in the world. Frank and Na met me at the airport, and we headed towards the hotel that I had booked for the first night (the excellent Siam Society hotel and resort). 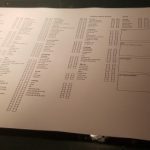 I had forgotten the hotel documentation and even with Na’s help we were unable to find it the first time. We went back to Frank and Na’s and they showed me around their condo. Collected the info on line and we took a taxi to the hotel, checked in and then headed for Town. 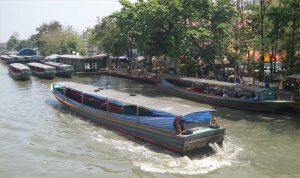 A had seen quite a lot of Bangkok, on my 4 previous trips there, but Frank found some things I hadn’t seen, and we wandered around. 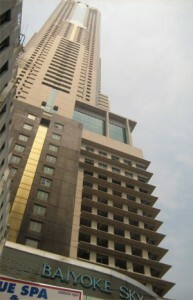 The Baiyoke Sky tower II is the highest building in the Kingdom of Thailand. There were some interesting (and some strange) things inside the tower, which is also a hotel. I realised just how much living in Thailand had changed Frank. I wanted to be photographed driving this tuck tuck. I asked Frank if we needed to anyone’s permission, and he just said get in it and ill take the picture. He certainly has become a lot more practical and direct while living in Thailand. On the 84th floor is a spectacular revolving roof deck, with 360 degree views of Bangkok. 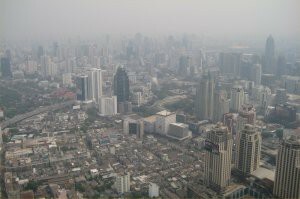 It was from this vantage point, that you could really see just how much smog there is in Bangkok. It was quite amazing to see the sprawling city. 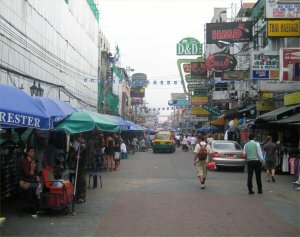 One place I have always put of visiting, is Khao San (pronounced Kow-San) road. 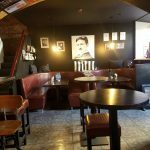 Years ago, it was a haven for travellers and backpackers, but today is just a tacky collection of hair dying and fortune tellers. You can buy fake student cards and even University degree’s here. It was nice to pop into an Irish bar and have a pint, but aside from that, I didn’t see anything that made me want to ever go back. As we walked along, Frank pointed out this Police vehicle, which in the UK would be called a meat wagon. Apparently, criminals are “collected” off the street and packed into this thing in the baking evening heat. 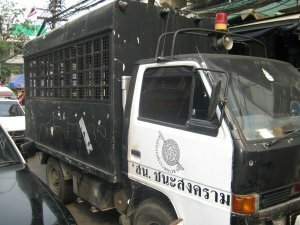 The human rights of criminals, don’t seem to be a high priority in Thailand. 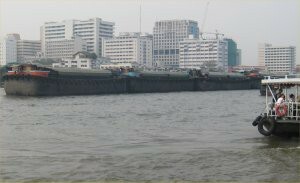 These enormous barges travel up and down the Chao Phraya river each day. In some cases a relatively small boat could tow 6 or 7 of these things. We went on a boat trip. One of the touts at the waterfront tried to over charge us. Frank was all over it. His point was I think a fair one. The normal price for the boat trip is 20p. Just because you have money, why should you pay £2. We wandered around some more (I’ve seen most of the sites of Bangkok, so today I just wanted to walk around and just enjoy being there). We jumped on the skytrain. I took this picture, as it captures several of the things that are synonymous with Bangkok. On the left top, a superb building left unfinished after the problems with the Asian markets a few years ago. 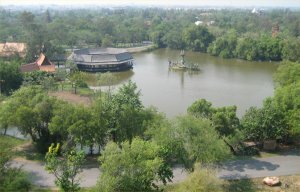 On the right, some traditional buildings and loads of trees and vegetation. On the left bottom, some old ramshackle buildings where the locals live in “budget” accommodation. In the evening, we went to an Irish Bar and I met Franks friend Matt and his lovely girlfriend Anne. Later in the evening we had chicken and rice known locally as khao pad gai which a grew to love during the trip. Frank and I left for Koh Chang the following day. 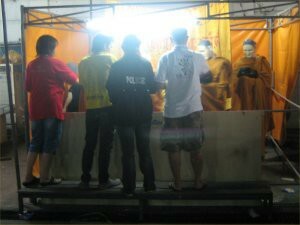 On the evening that we returned to Bangkok, there was some kind of Buddhist ceremony taking place. There is a temple right next to the condo and Ann and Na wanted to visit it. We waited outside, and were presented with this strange scene. A series of mechanical monks (basically clothing dummy’s with traditional robes put on them) rotate around on a revolving platform, you take turns at throwing money in the bowls they are holding. They reminded me of something out of Dr Who. As all the bars were closed, we spent the evening wandering around the local area. Matt had a day of work the following day, and we all decided to go out. 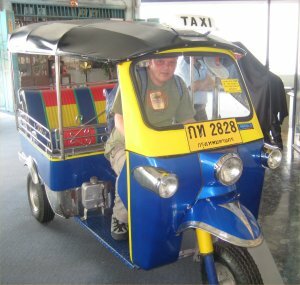 We drove around the city in style, in his car (watch a video of driving in Bangkok). Our first stop, was the Erawan Museum. Built by Lek Viriyaphant a wealthy Thai eccentric, who had also been responsible for the Sanctuary of truths which I had seen whilst walking along the coast of Pattaya. 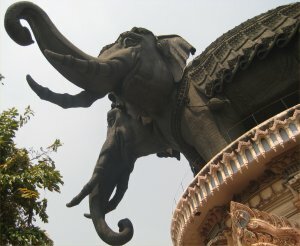 The huge bronze sculpture modelled on Airavata, the heavenly elephant of Hindu mythology, stands on a base pedestal. 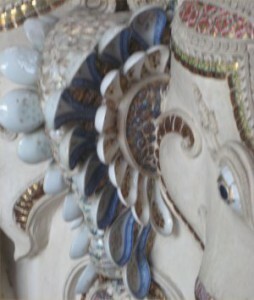 The pedestal is decorated with millions of tiny tiles enamelled in the fashion of Thai Benjarong ceramics. The museum holds a priceless collection of Thai art and Craft and is modelled on Airavata, the heavenly elephant of Hindu mythology. 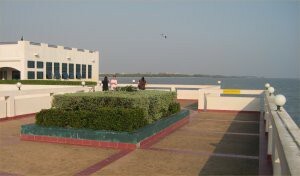 Tours of the museum start in the lower level of the pedestal, which houses the oldest artefacts. Unfortunately now photographs were permitted in the lower level. 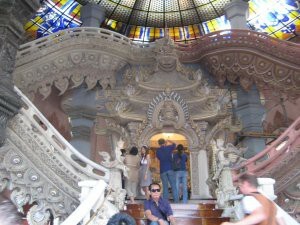 The upper level of the pedestal is dominated by an elaborate double staircase, also decorated in Benjarong porcelain. 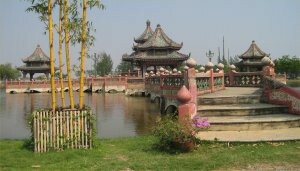 The structure is surrounded by tranquil gardens, waterfalls and statues. whole are is considered very lucky by local Thai people (most of the people in the museum were Thai, there were very few American, Japanese or British tourists, and those that were weren’t in large groups). It is rumoured that a girl went here and prayed, and a few minutes later, she bought a lottery ticket that made her a millionaire. Not sure if that’s true, but lottery ticket salesmen didn’t seem in a hurry to dispel it. A close up of the decoration of the staircase shows these oriental spoons and bowls put to good effect. From here, its possible to walk up a spiral staircase in one of the Elephants legs and go higher into the structure. In a sort of anti chamber with beautifully made wood panelling. 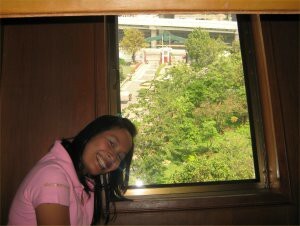 A window at the side, shows some of the gardens and fountains surrounding the statue (and provides a pretty good centre piece for a picture of the lovely Na). Further up the stairs, was this celestial altar with Buddha’s and religious artefacts. 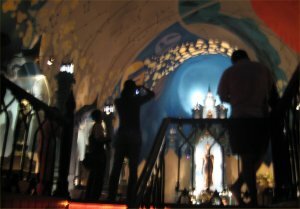 With its light blue and gold decorated walls following the contour of the elephant, the chapel has a rather ethereal feel. Off the temples I have visited around the world this was one of the most relaxing, and I lingered a while in there once I had seen everything. 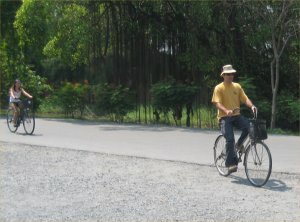 After the elephant museum, we went to see the ancient city or as its know locally Mauang Boran. 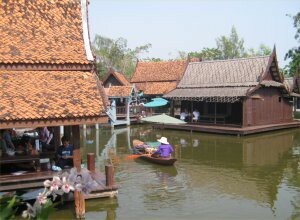 It houses a collection of the Thailand’s most significant historical sites, buildings and structures. Some of the structures some are actual size, but others have been scaled down to a 3rd of their original size. 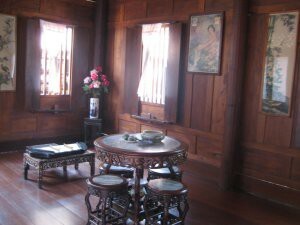 This room was part of a re-construction of an entire Thai village. The ancient City is more than 200 acres in size. We travelled around in Matt’s car, but many people toured it by bicycle. 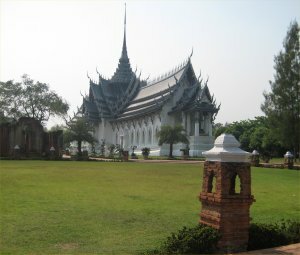 It is constructed in the shape of Thailand. Each of the structures, is positioned in the park relative to where the original structure resides in Thailand. 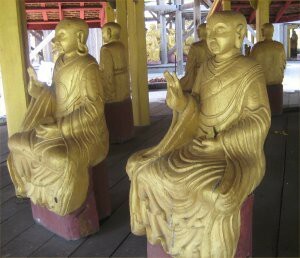 One of the 109 sites represented here, the Pavilion of enlightenment. Of all the amazing buildings this was my personal favourite. It’s recommended to spend a whole day there. We only hung around for a couple of hours, so I never got to research the historical significance of the site. You will just have to take my word for how astounding it was to be there. 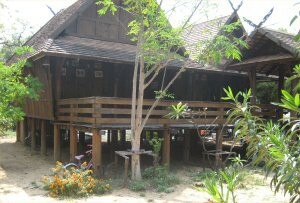 A traditional Thai house village house. One of the wild deer that live in the Ancient City. 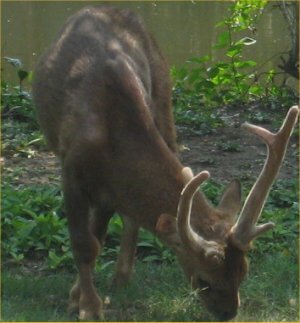 The largest outdoor museum in the world, it felt all the more authentic, to have animals like this, just wandering around. The top of the temple provides this spectacular view of the Ancient City. 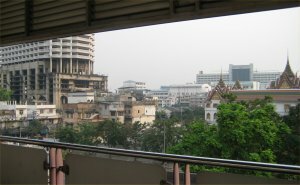 In 1962, following a serious dispute between Cambodia and Thailand over ownership of the temple, the International Court of Justice in the Hague ruled that it belonged to Cambodia. This building was probably the most spectacular in the whole park. I never actually found out what it was called, so if your reading this and you know, please email me. This isn’t actually a reconstruction, the original buildings were dismantled, moved here and then re-constructed in meticulous detail. I really enjoyed being in the Ancient city. 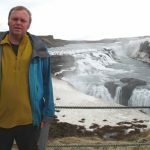 I love to explore, and it was like being able to explore an entire country and all its history in an afternoon. We decide to take some refreshments. Na has some sort of drink in a coco nut. Just like in a real floating market, there were traders, plying their wares from boats (although these were more likely to be souvenirs than rice or meat). 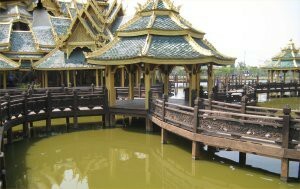 We left the ancient city, and went to visit Bangkok Pier. I had never actually thought about it before, be Bangkok, is right next to the sea. 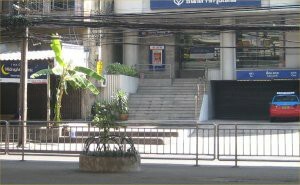 The place is owned by the Army (the Thai army have all sorts of assets and a General for example, can run several businesses whilst working for the government). 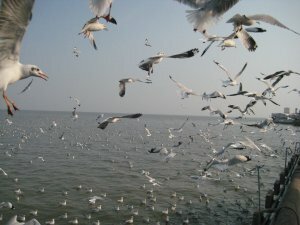 The main drive up to the Pier had the largest collection of Seagulls I had ever seen in 1 place. You were able to buy food to feed them, but there were literally thousands of them, flying around in a circle to keep coming back, to get more food. Frank and I take a boat into town; the same boat that Frank normally takes to work in the morning. In my minds eye, I had this idea of a serene relaxing trip along the water. It didn’t happen that way. They pull up plastic Tarps on each side of the boat, so you cant see out. The engine is dirty and the gearbox long past it sell by date, so the screaming and clattering of the engine and the pungent smell of fuel in my nostrils are my main memories of the trip. We get off the boat and just wander around looking at things. We eat an enormous fried Chicken meal in one of the shopping centres that would feed 10 people and cost next to nothing. We wander through a market. The stench of rotten meat came close to reuniting me with said meal for 10. We continue walking and Frank shows me this amazing scene just near his condo. To the left of the picture, a banana tree is literally growing out of the pavement. A brilliant trip, I would like to thank Na, Frank Anne and Matt for making me so welcome and I promise i’ll be back soon.